Every summer, my parents would take us to spend the school holidays with my aunt Vi and uncle Willie Iley at White House near Eastgate in Weardale. We would run wild for the whole summer with our cousins along the river Wear and in the woods nearby, splashing about in the shallow water, making bows and arrows, and playing endless games of hide and seek. Sometimes, tempers would fray. I remember one cousin chasing the rest of us across several fields with an axe, after I broke his new penknife. We had to climb a tree and wait until he cooled off. I also remember wild strawberries and other fruit in the woods, and the home cured bacon with fresh eggs for breakfast (rationing was only just being phased out) while my sister remembers the men returning from the river with trout and field mushrooms for lunch. On hot days the adults would take us to the ‘bathing pool’ next to a waterfall where a branch of the railway crossed the river – later, the cement works would ruin the pool, though it did create badly needed jobs. Another of my mother’s sisters lived at the top of Crawleyside; my sister remembers being very impressed by a collection of adder skins which were hung up outside the house. We also remember hearing the noise from a terrible crash at the bottom of the hill when the brakes failed on a descending lorry – or ‘wagon’, as they were called in those days. Laden with stone from a quarry, it smashed through the wall at the bottom of the hill, killing the driver – it must have been nearly a decade before the 1969 Crawleyside bus disaster in which 20 people died (Memories 188). My mother’s childhood included harsh winters in various remote smallholdings, with the compensation of watching her mother make butter and being given some cream to drink every day. During our childhood, her father Billy Dalton ran the shop and post office in Eastgate (before that, he had the post office and the pub). He had an open topped car and my sister remembers the thrill of being driven across the tops of the moors in summer. He used to treat us to ‘Mivvi’ iced lollies from his freezer, but his own favourite dish was a pie made with wild bilberries (very tart, and it turned your lips blue). His father had also worked for himself, working one of the old lead mines along with his sons after the big mining companies pulled out. Sadly, that work in his youth left my grandfather with a touch of ‘miner’s lung’ which would eventually kill him. My maternal grandmother came from a family of cattle dealers who had crossed over from Teesdale after having to move out of what is now the Morritt Arms when the landlord decided to make it into a coaching inn. Later, my great-grandfather Thomas Bainbridge reputedly drove a herd of cattle all the way to Liverpool for export to Canada. After selling them for a good price, he went for a celebration drink. He must have been fond of the animals because he decided to say farewell to them, but passed out on the boat and when he woke up… it had sailed. 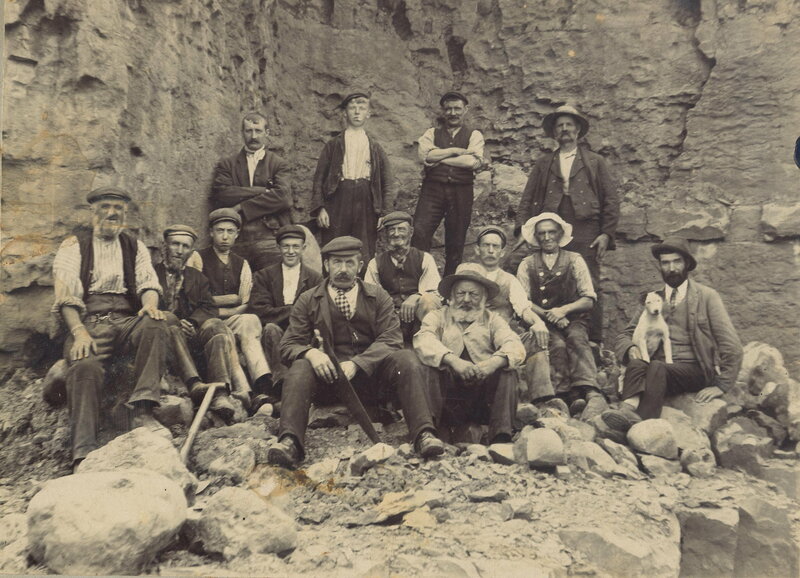 My paternal grandfather William Wilkinson was a quarryman in Frosterly (above, third from left) before landing a job as a gardener at Stanhope castle; the family scrimped and saved to send my father to teacher training college. 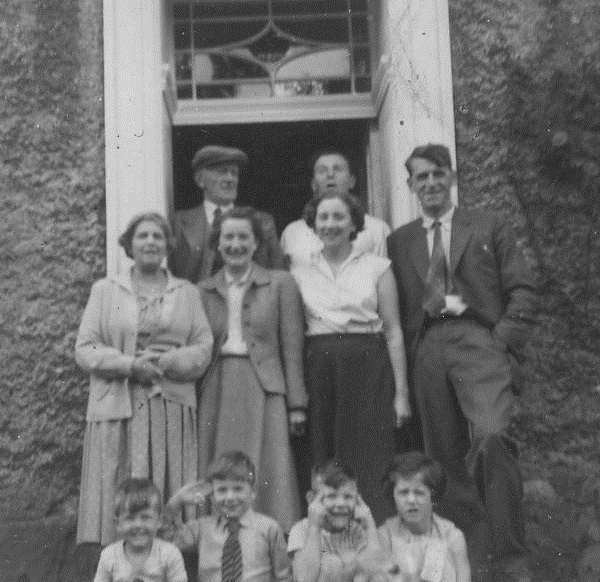 One of my earliest memories is of watching a fire caused by lightning in the castle grounds from the window of my grandfather’s tied cottage (now demolished, though my father salvaged the precious greenhouse).